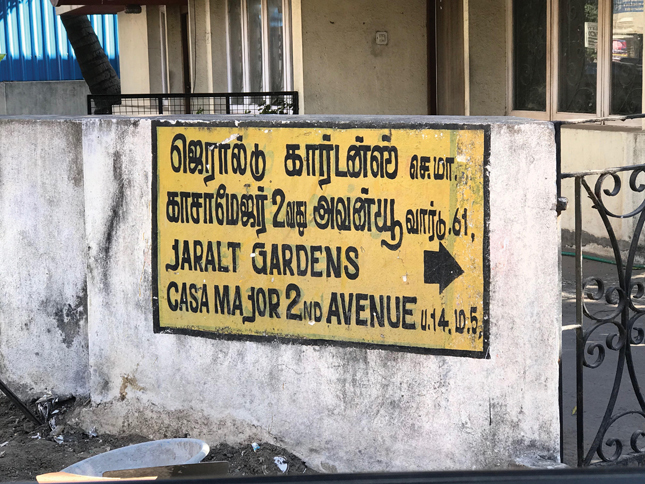 The signage in Tamil on the yellow-coloured concrete block reads Geraldu Gardens, while the English one below says Jaret. The correct name is Jarretts Gardens. Now reduced to two streets, 1st and 2nd Avenue, with the Guild of Service and the Madras School of Social Work in the middle, this was once the vast garden of a bungalow of that name. And it has a long and interesting history. The first occupant of this property, at a time when it ran all the way from Casa Major Road, Egmore, to the Cooum river behind, was Thomas Jarrett, who according to HD Loves Vestiges of Old Madras, was a civil servant who moved to Madras in 1805 from Bencoolen in Java. He left for England in 1822, where he died in 1837. Other documents show that Jarrett had several facets to his personality. He was Secretary of the Madras Committee of the Church Mission Society and in that capacity did much to propagate Christianity in this region. He interested himself in particular in the Jewish community in India and became more or less a local representative of the London Society for the Promotion of Christianity among Jews. He translated St Mathews Gospel into Hebrew and published it at his own cost. Copies were distributed among the Jews of the Malabar region. A publication dating to 1807 also has it that he translated the Gospel into western Malay as well, under the auspices of the College of Fort William, Bengal. After his time, the property became the residence of Dr. S. M. Stephenson, Superintending Surgeon, Government of Madras. He died at sea in 1834. By the late 1800s/early 1900s, the whole property had become one of the 99 garden bungalows in the city to be owned by that contractor and builder, Thatikonda Namberumal Chetty. He appears to have lived here briefly before moving on to Crynant in the Chetpet area. It is not clear if it was during his ownership or earlier that Edgar Thurston, of Castes and Tribes of Southern India and Government Museum fame, began the Madras Fine Arts Society here. In the late 1800s, exhibitions of paintings under the auspices of that body at Jarretts Gardens were a regular feature and one among those whose works were displayed was Raja Ravi Varma. He was also invariably a prize-winner and by the early 1900s had taken a decision not to compete, being happy to just display his works here. The next illustrious resident of this property was Sir Robert Bailey Clegg. Born in 1865, he had, after graduating from Oxford, qualified for the Indian Civil Service and been posted to Madras. He rose to become First Member, Board of Revenue, and was also Member of the Madras Legislative Council, retiring in 1917. Love writes that the house in Jarretts Gardens was demolished recently, which probably means 1913. However, this does not tally with the fact that Sir Robert Bailey Clegg was in residence till 1918. What is likely is that Namberumal Chetty had brought down the old house and developed a new one on the same site and Sir Robert was a tenant. Whatever be the case, the property, or at least a significant part of it, was owned by Namberumal Chetty and his family for quite a while, right up to the 1960s. That was when the Guild of Service and its offshoot, the Madras School of Social Work were both hunting for premises of their own. They had till then got along quite well on grace and favour spaces, the Guild being housed at Philroy, the residence of its Secretary, Mary Clubwala-Jadhav, in Nungambakkam, and the School, begun in 1952, operating from a small cottage on the premises of the Madras Seva Sadan of Lady Andal Venkatasubba Rao. It is perhaps no coincidence that both institutions zeroed in on Jarretts Gardens, for Namberumal Chettys grandson, T. Harikrishna, was Treasurer to the Guild. The School, being in urgent need of space, moved in as a tenant into one of the two buildings, even in the 1950s. Negotiations for purchase began in 1962 and by the end of the year, a price of Rs. 2,75,000 was finalised for 62 grounds (a ground being 2,400 sq ft) of land, together with two old buildings on it. Rs. 75,000 was paid upfront by the Guild and a loan was availed of from the Egmore Benefit Society for the rest. On April 21, 1967, the foundation stone for the new buildings of the Guild was laid by S. R. Venkataraman, the organisations long-term Vice-Chairman. Work then progressed slowly, the Guild being chronically short of funds. In 1968, the School took over a part of the dues to the Egmore Benefit Society and became an independent owner of part of the property. It eventually put up its premises there. The Guild continued operating from Mrs. Clubwala-Jadhavs residence even as work on its new premises happened sporadically. But with the golden jubilee of the Guild happening in 1972, there was a spurt in activity. Fund-raising events were held and, through them, money was realised to complete the new buildings in time. These comprised, among other buildings, a meeting hall that was named after a past member Mrs. C. T. Alwar Chetty, wife of one of the scions of the V. Perumal Chetty clan. The Guild took its time moving in, doing so only in 1975, after Mary Clubwala-Jadhav had passed away. It has since remained there, as has the Madras School of Social Work. Jarrett, the good Christian, would have approved of the fact that his erstwhile home is now a site for social service.